This article and images are courtesy of volunteer John Noddings of Seaview Fionnphort. Inch Kenneth, which is privately owned, is situated at the western end of Loch Na Keal close to the Mull shore on its south side. The name derives from ‘inch’ or ‘innis’, an island, and ‘Cainneach’, St Cannoch, the name of an old Irish saint, a friend of St Columba. 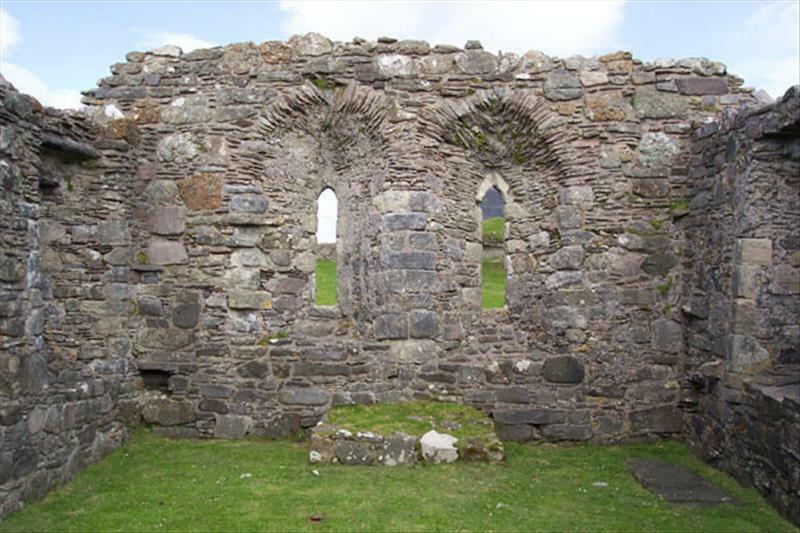 On the island there are ruins of a 13th century church with its double lancet window on the east wall. The base of the altar can be seen along with funeral monuments and carved stones dating from mediaeval times. Most stones commemorate MacLeans, but it is said that Kings of Scotland were buried here if storms prevented passage to Iona. The stones are carved with various intricate carvings of animals, plant scrolls, ring knots, galleys and swords, and are from the 14th, 15th and 16th centuries. Beside the church, within the graveyard grounds, is a sandstone slab bearing a full length effigy of an armed man in high relief. His head rests on a cushion and his feet against a lion or hound. In his right hand he holds a round object, perhaps a cannonball, and on his left arm is a targe bearing a raised shield on which a coat of arms was once carved or painted. Suspended from his waist belt is a sword resembling a 16th century claymore, while at his right hip is a dirk. In the graveyard is a ring-headed slate cross of Latin Cross design, possibly dating to 1500–1560. The shaft is bordered on each side by a chevron pattern. Towards the base of the shaft, are a pair of shears and a single-sided comb. 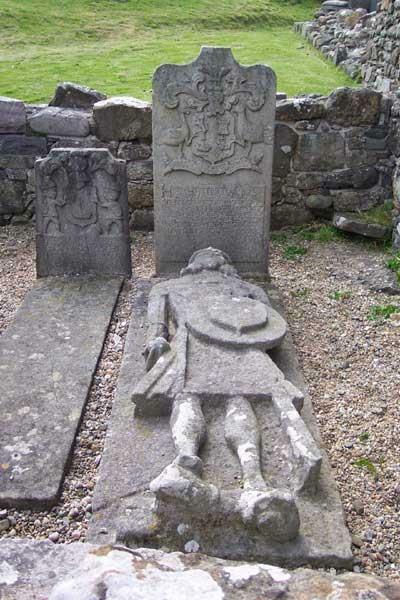 A headstone commemorates Dame Mary MacPherson, Lady MacLean, who died aged 30. On the front is carved a heraldic achievement with a shield charged for MacPherson, a galley with sail furled and a sinister hand holding a dagger. The supporters are two men wearing plumed helmets and carrying targes. On the back of the slab is carved the armorial achievement of the MacLeans of Duart, the shield bearing quarterly, a lion rampant, a castle embattled, a galley and a salmon, and a dexter hand cupped holding a cross. The supporters are two ostriches, and a skull and cross bones are incised at the base. 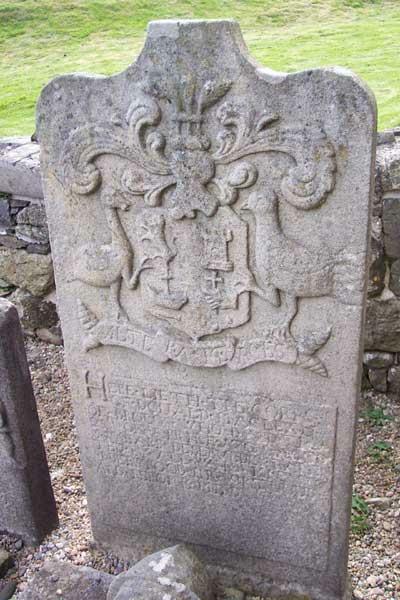 Another large headstone commemorates Donald MacLean (3rd) of Brolas who died in 1725. The front bears an achievement similar to that on the tombstone of Lady MacLean, with the motto “ATERA MERCES” (another reward). 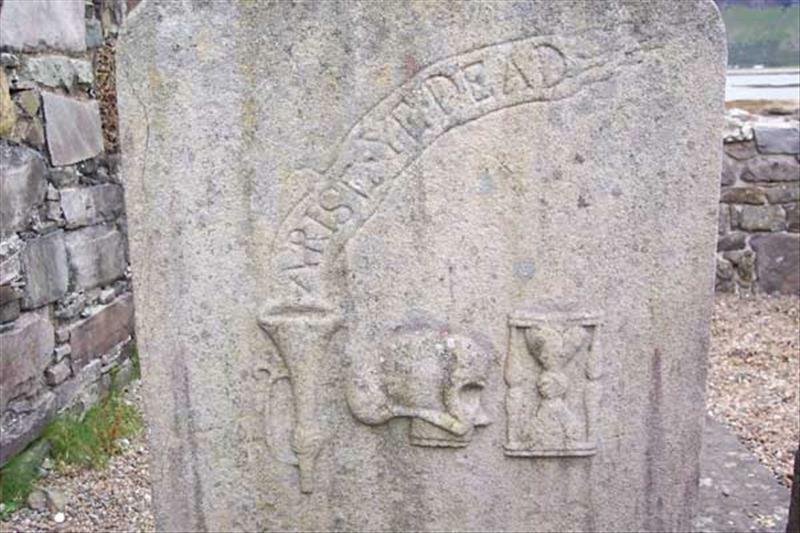 On the reverse are carved in relief a skull, an hour-glass and a trump from which proceed the words “ARISE YE DEAD”. For those who gave Their live for Mull.